Short telephoto prime is designed for full-frame Canon EF-mount DSLRs, however can also be used with APS-C models where it provides a 104mm equivalent focal length. Specifically designed for macro photography, this lens has a 9.4" minimum focusing distance along with a 1:1 to 5:1 magnification range for life-size or greater rendering. This lens does not offer infinity focus. Floating elements system helps to maintain consistent image quality throughout the focusing range. Six-blade diaphragm contributes to a pleasing out of focus quality when using shallow depth of field. Front ring of the lens supports direct mounting of an optional Macro Twin Lite or Macro Ring Lite and the lens has electric contacts for full-support of the E-TTL II flash system and for relaying accurate focus distance information. MP-E 65mm f/2.8 1-5x Macro Photo Lens is rated 4.7 out of 5 by 166. Rated 5 out of 5 by Anonymous from Great niche lens This lens requires some skill, but it can get results that no other DSLR lens can. I have both this and the 100mm f2.8L macro. The 100mm is arguably a better lens for 'regular' macro, but this one can get incredible magnification. It opens up a whole new world. . Here's an idea of scale: I shot the side of a blade of grass at a 45 degree angle (5x, tripod, sunlight, no flash). It more than filled the frame. Only a small ribbon is in focus, and there's a really nice blur in the background and foreground. . If you love macro and you're willing to put in the work, get this lens. If you want an easy lens to walk around with, get the 100mm f2.8L. Rated 5 out of 5 by Thunder from The best there is for extreme macro This is the only game in town for extreme macro. Forget reverse mounting lens, forget bellows, ext tubes etc. Save your pennies and get this lens. Is it a challenge to use? You bet it is. But I am here to tell you that you do not need a tripod if you use proper form and take advantage of things like your camera bag. A little tip, set the lens at the mag you want to use and rock your body to get the focus. Now, if you wish to photo stack you will need a solid support system. I have used this lens for a month now, and I am amazed daily with what it can do. Sharp, clear throughout its range. Canon, you did good. Rated 4 out of 5 by jmpdctr from Only if you are really good. This is a very advanced lens. It is superb for near microscopic work, but it takes some time to learn to use. Admittedly, I am at best an intermediate photographer, but I also have a 50 and a 100 Macro that I have pretty much mastered, and this is far more difficult to use. That said, if you want to take a full frame view of a 1/4 inch flower, this is the way to go. Would not advise even thinking about hand-held shots. The depth of field with the faster speeds is infinitesimal and unless you are looking for that effect of a minimal plane of focus, use a tripod. This is worth the price, but only if you are good and only if you are into micro. Rated 5 out of 5 by Anonymous from Opens up a whole new realm Was able to get excellent results the first time I used it at 5x with my EOS 5D & MR-14EX macro Ring Lite. Tripod is a must but have gotten decent results hand-held outdoors at 1x with continuous shooting when there is no wind (just shoot lots of photos, be prepared for an extremely shallow depth of field, examine the results closely, and plan to discard most of them!). Note that you must remove any filter(s) before you attach the Ring Lite so take extra precautions not to scratch the lens. The lens extends WAY OUT as you increase it to 5x so also be careful that you don't touch the subject. Rated 3 out of 5 by Anonymous from hard to learn how to focus This lens is sharp and powerful! However, its usefulness is limited because of the focusing. I knew that it did not autofocus when I purchased it, but I did not know that there is no manual focus either! Focusing is obtained by moving back and forth slowly. I do have a focusing rail and it works very well on a tripod with the focusing rail. However, I wanted to use the lens with flowers, bugs, butterflies, etc. and it is too hard to move back and forth to focus on things that move. People looking for sharp images of stamps, coins, and other inanimate objects will love it, but nature photographers might just be frustrated, like me. Rated 4 out of 5 by Macro_man from Steep learning curve but worth it This lens is a blast and I love it but, be prepared for a steep learning curve. Some people have complained about a lack of auto focus may they not understand how different and complicated working is this environment can be. Let's just be glad we live in a digital world and don't have to spend a fortune on processing film anymore. Also, you might was well plan on getting a macro focusing rail. It's easier than moving the camera or subject 1mm to the front or back. Construction is very solid but think for the price they could have included the lens shade and a case. Let's face it, what this lens is is basically a 65mm reversed lens with about a foot of extension tube. Rated 5 out of 5 by Midav from Quality Lens This lens is not for the novice. You literally have to be 2 inches away from an object to take a pictures. Macro rail and macro ring flash is highly recommended. If you are new to macro photography you should start with 100mm 2.8 lens instead. Also, not a best lens for taking pictures of jewelry. Even at 65mm 1:1 zoom you can only get half the ring in the view finder. Focus area is very small - that's why macro rail is needed to make fine adjustments instead of moving the whole tripod. Lens body is very sturdy and quality built. Because you need macro flash and macro rails to use this lens on a stationary objects - it would cost almost $2000 to get started with proper setup. Rated 5 out of 5 by BR Captured from Amazing MACRO lens....a microscope I use this product for insect and flower macro work currently. It will get you there at 5:1 macro. Images are clear and sharp. It truly is a microscope on a digital camera. It is a little heavy and will wear down the few (like me) who at times hand hold it. Soon you will find that you need a tripod or need to be satisfied with 1:1 or 2:1 Macro. At 3:1 or more, even the slightest shake will alter measurably your photo. A tripod and mag slide are must tools as is a circle light. This entire set-up is not cheap when you add up all the necessary items. But then, nothing beats it. You will be shocked at what you see through this lens. The only problem is getting light to the subject. If i use this lens on a Nikon d800e body with the fovslxeosnik adapter will i be able to adjust the aperture? The FotodioX Vizelex Canon EOS Lens to Nikon Camera Adapter with Macro B&amp;H # FOVSLXEOSNIK does not pass electronic signals so no aperture adjustment is possible. Can I adapt this lens to a Nikon F mount with a converter like the Fotodiox mount adapter? The lens was designed to allow a Canon body to control the aperture electronically. To use the lens on any other body, you need a mount adapter with an integrated iris for manually controlling aperture. 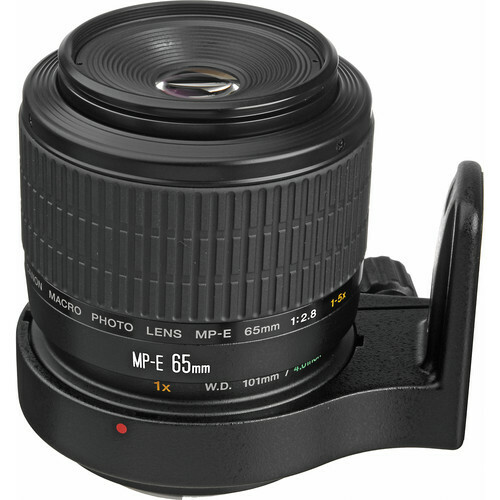 Is canon MP-E65mm USA works well in Indian climate also or there is any problem? please inform the right answer. The Canon MP-E 65mm f/2.8 1-5x Macro Photo Lens just as well as any lens in most climates, but it is not weather-sealed. If too much humidity or rain builds up outside the lens it could leak inside it and cause moisture problems that a weather-sealed lens may not encounter. Whats the maximum focal lenght? I wonder if it can work for portraits as well as Macro photography! Yeah--you can't focus this lens. Or to clarify, the only way to focus this lens is to move toward or away from the subject. It is very much a specialty lens for macro photography, not portraits. You'd be sorely disappointed if you attempted to use this for that purpose. is it possible to use this lens hand held and and get decent pictures? or is a tripod and rail mandatory? Also can this lens work with an APS-C sensor? The use of a tripod and rail is not necessary when using the Canon MP-E 65mm f/2.8, however, when shooting with a macro lens, it is highly recommended to use these products when shooting macro photography, as you will typically be using slower shutter speeds. This lens can be used with cameras that have APS-C sized sensors as well as full frame. I am in the learning stage of extereme macro. I have a Canon 100mm macro and use it a lot. Looking at lo=me websites I see using a stacking rail and Raynox lens are used. Would these be necessary? I can see the stacking rail, maybe not the Raynox? what are your thoughts. I would be thinking about a sturdy tripod, a rail and lights. I do not see the reason at all for a Raynox conversion lens. I would suggest starting with the lens and tripod. As you go you will see better what you want as accessories.Here are some suggestions as possible products. Velbon Super Mag Slider Macro Rail - Magnesium B&amp;H # VESUPRMGSLID or Kirk FR-2 Focusing Rail with Neoprene Pouch B&amp;H # KIFR2WBAG. Bolt VM-110 LED Macro Ring Light B&amp;H # BOVM110 or Canon MR-14EX II Macro Ring Lite B&amp;H # CAMR14EXII. The prices reflect affordability vs precision and durability. Will this lens work with EF Mount specifically the 5dm3? Yes, the Canon MP-E 65mm f/2.8 1-5x Macro Photo Lens is EF mount and will be compatible with the Canon 5D Mark III, as well as all other EOS DSLR/SLR cameras. can this lens fit to Sony NEXFS700R 4K Super 35mm Exmor CMOS ?